OK – I know I’m the CRM guy and this one isn’t a CRM but it’s darn sure relevant to it and it’s something I think will become quite popular. When Heather Wahl, the developer and owner of AOSDates approached me and she showed me what she had I immediately jumped on board. As a real estate agent, when it comes to the time between contract and closing, you are the conductor. You have all the players and you need to make sure everyone is on the same page. How much time do you spend checking the details of each transaction and then either calling or emailing the responsible parties to make sure they are doing what they should be doing, when they should be doing it? Sending those reminders is what AOSDates does for you, automatically and very inexpensively – only $4.99/mo.! One of the best values I have ever seen, especially given how much time it saves you. One thing I’ve learned over the years is that real estate agents love simple and easy to use. This product epitomizes those qualities. Another things is that agents can be quite discriminating about the look of a program. I was really impressed by how crisp and clean this was as well. Nice huh! So what does it do? You get a contract, you transcribe the number of days after the contract or before closing that you want to send the reminders out, and you’re done. You can make it as simple or as comprehensive as you like. Now not only do you not have to spend all that time finding out what reminders to provide to whom, but you can’t FORGET! The system does it for you. As much as I try to show people the many advantages of using your CRM for transaction management, many don’t want to do it. It takes time to get them set up and most agents don’t understand the value. So – in comes AOSdates. It is essentially a tool that is very easy to set up and use, that reminds you, your clients and any other parties int he transaction when a task is due, as well as generating reports and schedules for said tasks. If you have spent much time on this site, you know that I generally only have CRMs for sale and just a hand-picked few other products which are here under “Follow-up”. My Trans-Plans transaction management plans are set up to cover every little detail. Easily over 100 per transaction. AOSdates simplifies the whole process. You just decide what tasks, such as a mortgage commitment date, that you want to be reminded of. You also add the parties involved. The difference between using them in a CRM vs AOSDates is simplicity. 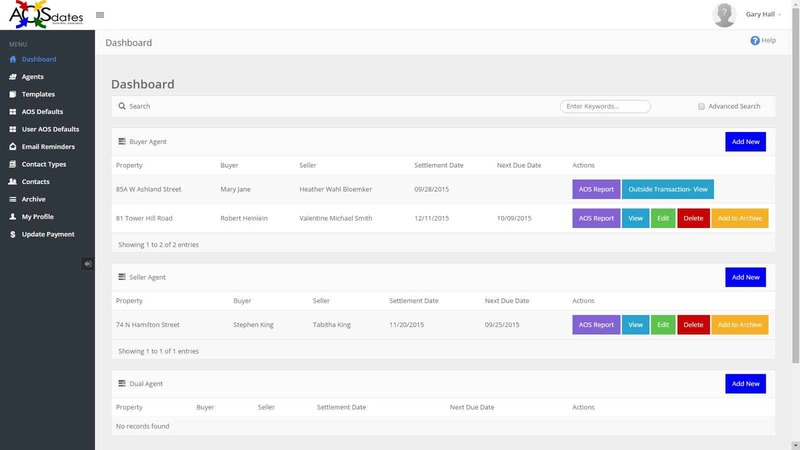 If you don’t want to use your CRM to do transaction management, but you might want to try something easier to accomplish part of what that does, you probably want to check this out. For a free trial, no credit card required. And when you sign up on my site you get a copy of my book “Choosing and Using a CRM” for free! Top Producer Suite on Sale! I just got a notification that the 5 Street Suite Bundle has been reduced to $94.95/mo. from $99.95/mo. That includes Top Producer 8i (the current version), Market Snapshot, and Five Street. If you’re interested give me a call to get this sale price at 215.345.5222.
https://garydavidhall.com/wp-content/uploads/2015/02/GDHLogo340.jpg 0 0 Gary David Hall https://garydavidhall.com/wp-content/uploads/2015/02/GDHLogo340.jpg Gary David Hall2015-04-02 13:43:032015-04-02 13:43:03Top Producer Suite on Sale! I’ve known Albert Clark since August 2003 when he approached me with a question about Agent 2000 for one of his clients. At the time he had started My HomeOwners Club which was a great idea, and the genesis of HomeActions. After that it was Real Ping which I still use. He has always had great ideas. The most current one is the HomeActions Newsletter. I have been using it for some months now and I love it, as do my subscribers. I send it out every two weeks and it always has topical, eye-catching articles. Check it out by clicking here (10% discount), or subscribe yourself to mine so you can see what your clients would receive by clicking here.